The Pirate’s Parrot Show is a Fun, Educational, and Interactive experience for all ages and cultures. 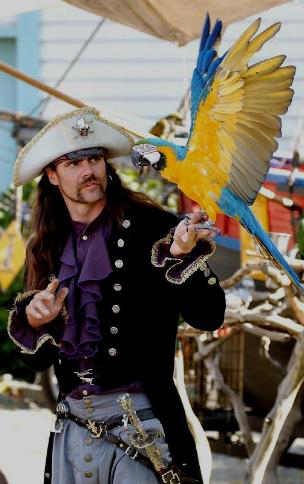 This informative show comes complete with a large variety of parrots from around the world, “real” pirates, an authentic Pirate Ship display, and delightful speech and freeflight performances. Each year, 30-50 thousand people from across the country are amazed and delighted to safely hold and pet these parrots. Read what people have to say about 'The Pirate's Parrot Show'! An educationally based pirate-themed parrot show that has performed at state and county fairs across the US since 1989.